Video calls and chats is of great advantage in the telecommunication. I usually recommend video calls to most tasking business that calls for conference meetings or any related issue from a far distance. Of course, we know that with video calls you can easily judge someone's reaction through assessing their body language, like knowing if the person you're communicating to is either smiling or frowning. Unlike the normal social messengers, you can hardly detect such body language. Video calls also help in terms of strengthening of social relationship. It also helps to save time, unlike travelling distance journey for a conference, instead video calls can help to attend such conference from your home and this also helps you to do business at any time. With the above stated benefits of video call, you would be needing some recommended Apps that helps access video calls. 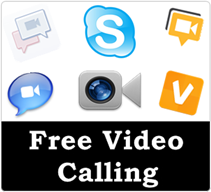 Below, I would be highlighting the 5 Best PC Apps for free video calls. Facebook is a cool social media platform and it's fun being on facebook media. Facebook lays another great ground by introducing a video calling or chat system, that is, through your PC, you won't just only chat with your friends unseened or share updates with them, but also interact with them through the use of your PC webcam. 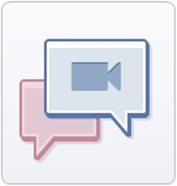 The facebook video chat app for PC is really a nice one, with skype video quality. Google+ hangout is another video chat system that was introduced recently with the feature of making free face-to-face calls with even upto 10 different faces at once. It's actually a well protected Google chat system with good quality and can be accessed through Gmail account to hangout by upgrade. The hangout can be used on any browser or Operating system (OS) with any form of restriction. So download your Google+ hangout through itunes, web application or playstore, and start the hangout with your families and friends at no cost. ooVoo is one of the topest and popular video calling software with over 30 million users and it's video quality is very high. With ooVoo video chat system, you can make a group chat with 12 persons at the same time. You can simply get the ooVoo application of Windows and Mac OS and it's also avaliable on smartphones, like androids and iPhones. iChat video chat app is close to the best video chat app that can be done on only Mac OS based products. It's video quality is quite high and you can make a video group chat with over 3 persons. I highly recommend this chatting system for Mac OS users, because they seems to be the best video chat application for Mac OS. So you can simply check your apple official application store to download the iChat for your computer. Skype is the best video calling chat system and also the most popular video chat system, worldwide. For some years now, Microsoft did acquire the skype video chat system, and it's now known for the best voice and video communication system which is avaliable on all operating system for PC and also avaliable on androids and iPhones. With the skype app, you get free skype to skype calls. They also provide a paid facility, when making calls to non-skype users or any phone number at a very affordable price. I'd recommend the skype video chat app for all users, because it's the best of all. With the above Video chat application, you would be able to make cheap video call, and most video calls at no cost. All the above video chat apps listed above are very well recommeded and have no form of lags or bugs in them. Their video quality is also rated with cool navigation features. So if you got any video chat or calling app that you know is also popular and compared to the ones highlighted above, then feel free to bring it on, and we would love to update it. I HOPE ALL THESE APP DONT CONSUME DATA ? Sure, this is a good list. I make use of Skype and Hangout and I can confidently say they are very dependable! For businesses that want to improve social relations and videos, these must have tools are readily impressive. I also recommend them for efficient video conferencing!